Find out what Christmas means for Jaimie Admans and her newest heroine, Mistletoe Bell! 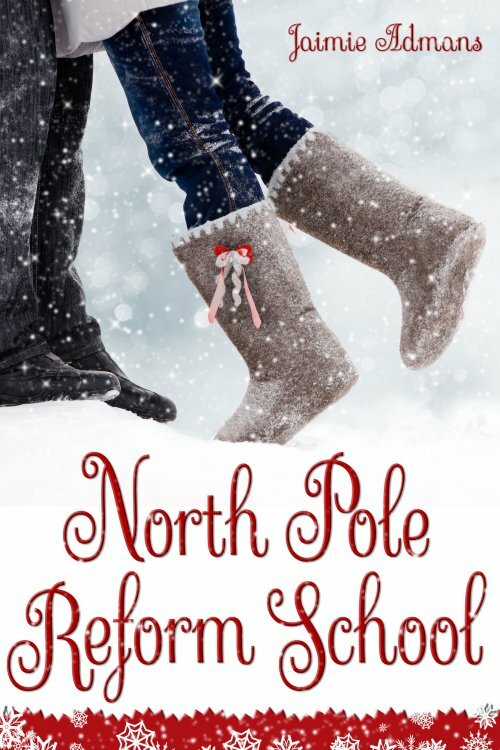 This week sees the release of Jaimie’s newest offering, North Pole Reform School, a YA romantic comedy. I’ve said it before and I’ll say it again – nobody writes quite like Jaimie Admans, she has a refreshing and original voice and I absolutely love her books. North Pole Reform School is no different and people who love Christmas films like Elf will absolutely love this book! So… here’s my Q&A with Jaimie. 1. What’s your first Christmas memory? I remember waking up to find my mum putting a stocking full of presents at the end of the bed! I don’t know how old I was, probably 4 or 5, but it was the first time I realised Santa wasn’t real! I don’t remember being overly traumatised by it so maybe I suspected he wasn’t real anyway! 2. What’s your best Christmas memory? I don’t know! I have loads of good memories of Christmas when I was little! I loved having all the family in and all the presents stacked under the tree, and I was the one responsible for handing them out when I was barely old enough to be able to read the names on them! I remember jumping on my mum’s bed at 4am when I knew she’d got me the Princess Jasmine doll I’d wanted for ages! The Christmas our dog ate the whole tree and most of the presents under it was pretty fun too in a disastrous kind of way! I think overall my favourite memory is rushing downstairs at ridiculous-o’clock every morning in December to eat the advent calendar chocolate and sing Christmas songs when everyone else was still asleep! My family must’ve hated me in December! 3. Can you tell us anything about the parents that were strange/ mental enough to call their baby Mistletoe Bell? They’re completely mad about Christmas! Her dad works as a Santa in a supermarket and her mum wants to be a Mrs-Claus-esque host of the perfect Christmas! They had their first kiss under the mistletoe at a Christmas party, and when Mistletoe was born on Christmas Eve, they thought it was some kind of sign that she should be lumbered with an embarrassing Christmassy name for the rest of her life! Of course, they think it’s the loveliest name ever and don’t think it’s embarrassing at all! The book starts when Mis gets whisked away in the middle of the night to North Pole Reform School so her parents aren’t in it much, and I did cut a lot of their scenes and backstory as I wanted the book to mostly focus on Mistletoe and Luke – the boy she meets at the reform school! 4. This book seems very much to have the Jaimie Admans trademark surreal vibe, despite the fact that it’s a Christmas tale – where do your influences come from? Ha ha! I think I just have a really weird, slightly disturbing imagination! People do mention Tim Burton a lot in relation to my writing, and I have to admit that I absolutely adore him, but I don’t think he directly influences me! The whole idea for this story came from a newspaper headline – it was about a window cleaner dressed as an elf who was cleaning windows while balancing precariously on a ledge, with no harness or anything. The headline was ‘Elf and Safety’, and it immediately put an image into my head of elves in a classroom, learning the elf equivalent of our health and safety practices. Somehow that turned into an image of elves in a classroom teaching humans the same thing, and the whole idea of a North Pole school was born, and ‘elf and safety’ became a class that the Christmas-haters have to take in the book! 5. A bit random… what’s your favourite Christmas song and why? Up until a few years ago it was Fairytale Of New York by The Pogues, but now it’s My Favourite Time Of Year by The Florin Street Band! It’s just such a lovely, old-fashioned Christmas song! I fell in love with it as soon as I heard it! And it’s got such a snowy, Christmassy video! (Youtube link: http://www.youtube.com/watch?v=H10f2w7T5CU) I even managed to work a mention of it into North Pole Reform School! 6. Do you still believe in Santa? If so, what have you asked him for this year? Of course! You can’t write Christmas books and not believe in Santa! That’s the kind of thing that gets you a lump of coal in your stocking on Christmas morning! Seriously, I love all things Christmas, including Santa, and I actually wish he was real! How awesome would that be? I honestly don’t know what to ask him for this year, unless he could provide a winning lottery ticket? A winning lottery ticket and a massive box of Ferrero Rocher, please Santa! If you’d like to grab a copy of North Pole Reform School, you can buy from Amazon here. You can also check out Jaimie’s other titles and find out more about her by going to her website.